This hard shell case's exterior is made of a dense, injection composite plastic for superior external protection against blunt forces, drops, dings and other unforeseen mishaps that can damage your printer. Interior protection consists of a Tri-Layer arrangement of a Solid Foam Bottom, Dense Foam Middle With Printer and Accessory Cutouts and a Convoluted Egg-Crate Foam Top Layer. With the combination of a highly durable exterior and dense foam interior, you can be sure your workforce printer is protected at all times. Conveniently keep your printer and accessories by your side whenever needed with this discreet, yet highly durable case. 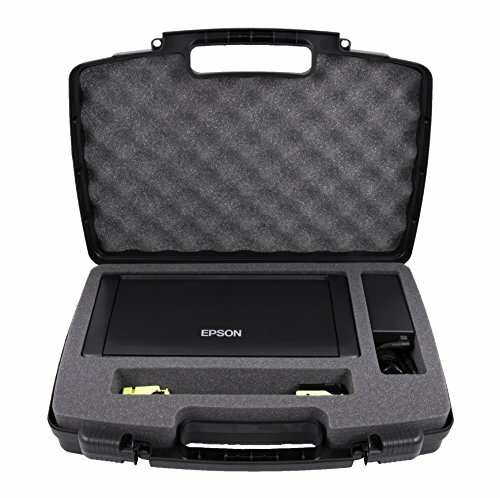 Measuring 16.5" x 11.5" x 3.8" in exterior dimensions, this case is perfect for on-the-go traveling or storage of your printer and accessories.